The great medieval necropolis of Cairo, comprising two main areas that together stretch twelve kilometers from north to south, constitutes a major feature of the city’s urban landscape. With monumental and smaller-scale mausolea dating from all eras since early medieval times, and boasting some of the finest examples of Mamluk architecture not just in the city but in the region, the necropolis is an unparalleled—and until now largely undocumented—architectural treasure trove. In Architecture for the Dead, architect Galila El Kadi and photographer Alain Bonnamy have produced a comprehensive and visually stunning survey of all areas of the necropolis. 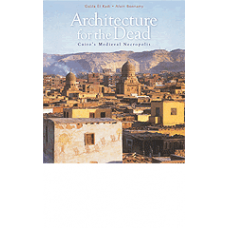 Through detailed and painstaking research and remarkable photography, in text, maps, plans, and pictures, they describe and illustrate the astonishing variety of architectural styles in the necropolis: from Mamluk to neo-Mamluk via baroque and neo-pharaonic, from the grandest stone buildings with their decorative domes and minarets to the humblest—but elaborately decorated—wooden structures. The book also documents the modern settlement of the necropolis by families creating a space for the living in and among the tombs and architecture for the dead.